Chhote Lal represents Uttar Pradesh's Robertsganj constituency. His complaint has emerged days after the ruling party faced massive Dalit protests across the nation, in which 11 people were killed. A Dalit parliamentarian of the ruling BJP in Uttar Pradesh has written to Prime Minister Narendra Modi complaining against Chief Minister Yogi Adityanath. Chhote Lal Kharwar, 45, has alleged that he met the chief minister twice, but was "scolded and thrown out". Prime Minister Modi has reportedly assured him that action will be taken. Chhote Lal represents Uttar Pradesh's Robertsganj constituency. His complaint has emerged days after the ruling party faced massive Dalit protests across the nation, in which 11 people were killed. Dalit groups were protesting against a Supreme Court order that they feared weakened a law that protects them from atrocities. Chhote Lal has reportedly complained to PM Modi that he was facing discrimination by the administration in his constituency and his complaints were not being heard by his own party. His letter names Yogi Adityanath, state BJP chief Mahendra Nath Pandey and another leader, Sunil Bansal. He has also complained to the National Commission for Scheduled Castes and Scheduled Tribes. "You see, I exhausted all my options internally within the party, that is why I went to the National Commission for Scheduled Castes. You please check at the local level and see if you can find any instances of wrongdoing against me. If not, then why is this happening?" Chhote Lal told NDTV. 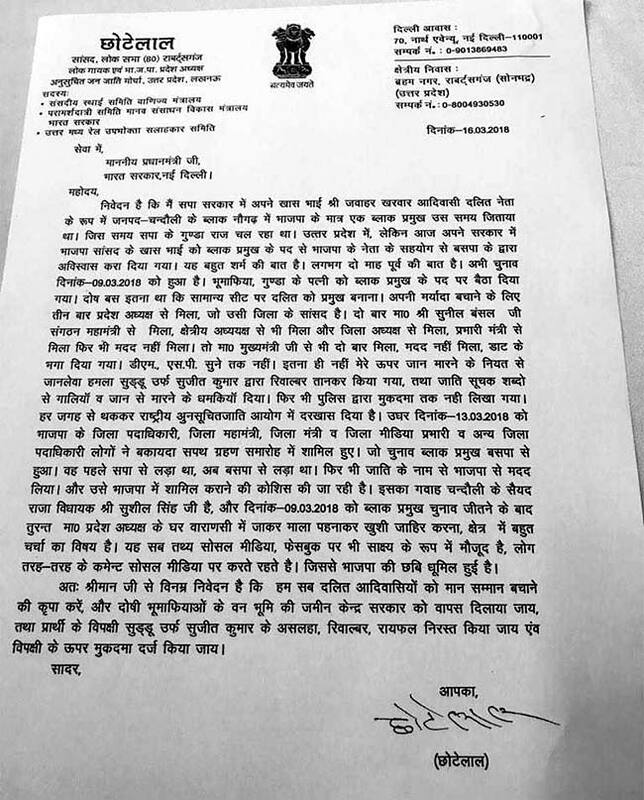 In his letter, he says he had been raising instances of rampant corruption in the district administration and forest department in the Chandauli district near his constituency for nearly three years. After Yogi Adityanath came to power last year, he said, he had hoped that the situation would be remedied but nothing was done. Rather, his land was shown as encroached forest land by the administration. He has also written that local BJP leaders have been working against him and his brother, who is a local politician, and are colluding with rival parties. The MP had surfaced last year in a controversial video in which he was seen making derogatory comments against the police. He was accusing the police and officials of bias towards a rival candidate in a local election.